Bogdan received last year a prize from the Autonomous University of Juarez in Tabasco, which has recently stepped in to continue a long tradition of awards to honour trajectories in various domains of public life previously presented by the Juchimanes de plata organisation. 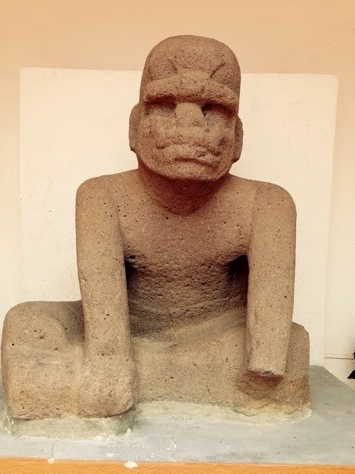 For Bogdan it came as a surprise to be connected with an unknown personality from 3,000 years ago, likely a guardian of some unknown entity, found in the midst of the Jungle, named by our current civilisation as Juchimán (his true name has been lost in the Olmec time). One night Bogdan found himself in the midst of the Tabascan jungle, where he actually met Juchimán. Bypassing introductions (missed opportunity for learning original name?) Bogdan instantly approached Juchimán with his preoccupation of the troubles in the present world, the crisis faced in every single country with a deterioration of living standards evident in most localities and asked, how he, coming from a very different era would suggest a solution to the present, seamingly unsolvable conflicts. There was silence for a few minutes, Bogdan told us, and then Juchimán, rather irritated asked to be left in peace so he could concentrate, there was too much noise in the background and if he made a mistake many more humans would pay a very high price should he make a wrong decision. He then asked Bogdan to disappear. After a brief period of intense fear – almost terror in the thought that he should vanish – Bogdan indeed disappears from the scene and from Juchimán’s world. Bogman then told us about waking up and wondering about his own artificial world, for which there would be some discussions in the symposium held in his honour. As much as I wish to be a polymath – I couldn’t convince myself to stay for today’s seminars as the mathematical language required to follow them is still beyond my reach. Bogdan Mielnik’s Inauguration Talk has been published.